Help Sunny the Rat to find his way through challenging labyrinths to finally grab a tasty piece of cheese - yummy! Will you take the challenge and help Sunny to escape the mazes? In Maze Rat you steer Sunny from cave to cave in order to reach the cheese. Caves are connected by tunnels that either crumble once passed or stay intact. Some caves will trigger nightfall or daybreak which impacts, whose turn will be next. You win a level by reaching the cheese or forcing Mr. Moon into a dead-end. You lose by stepping into a trap or being forced into a dead-end yourself. we are pretty excited that we finally made it: our first indie game publication, Maze Rat, is available for Android on Play Store. We launched the base version on October 18th 2015. 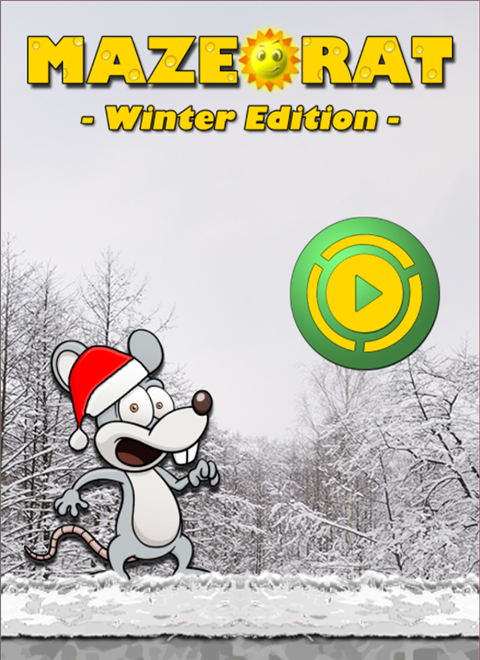 One month later, we published major update (Winter Edition) in November 21st 2015. After stumbling across SlideDB today, we posted the app here a bit delayed. Though our main focus was to create a game to make up for our childhood dream of creating an own video game, we hope that some of you guys will enjoy playing our game, too. Maybe you'll find the time and try Maze Rat. It's completely free and comes without ads.